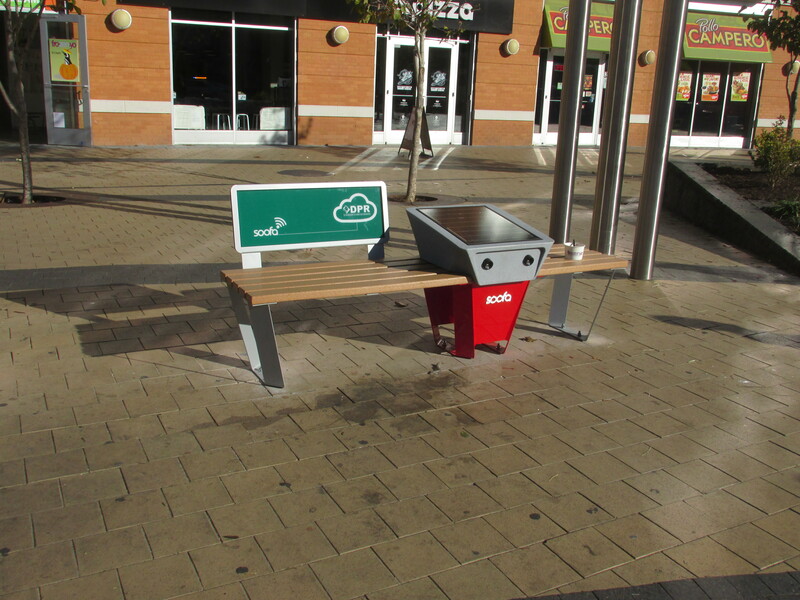 New Soofa Bench Placed at Columbia Heights Civic Plaza | Park View, D.C. This entry was posted on October 18, 2016 at 7:01 am and is filed under Public space, Random Observations. You can subscribe via RSS 2.0 feed to this post's comments. This is a cutesy but dumb idea. First, it’ll get broken in no time (ever see those chargers in the airport after a while? Wrecked, and they’re not exposed to the elements! Second, if you need to charge a phone, why not pop in to any of the many little restaurants around there, buy something small, and charge your phone. Third, I love that the “promo” video actually shows someone sleeping on the bench. Not the sort of thing we want to promote. I hope dearly that no taxpayer money was spent on this thing. Oh yeah, and the placement is not very smart. With all the homeless that hang out here and sleep, and with all the shelters nearby, and with the food truck that comes up to feed them, this is a good solution to help keep them in the area all day long everyday. Thank you, Brianne Nadeau. Saving the world one Soofa at a time. She is a kool-aid drinker who doesn’t understand how to achieve real world solutions. Was Nadaeu actually behind this or are you making assumptions? What does “monitors its environment” mean? At least your electronic devices will be charged for the criminals that steam them.